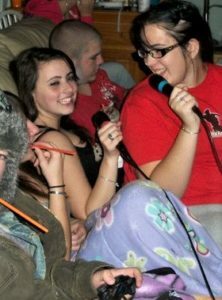 A picture of me sitting on a couch playing SingStar in high school around the time of a bad pain flare. We all have our ways of coping with CRPS pain. I’ve been using music to get me through everything in my life, especially CRPS. It’s time for me to share with you. For as long as I can remember, I’ve been singing along to music, making up my own songs, and dancing (even in a wheelchair) to anything and everything that comes on the radio. For a vast majority of my life, I was a dancer, a dance teacher, and a dance team coach. Everyone in my family played an instrument or could sing (not me though, I can’t get my voice to cooperate). I’ve always been on more of the A&R/music business side. At a young age, I started making mix tapes and making my own dance mixes on cassette tapes by recording pieces of songs and trying to make it flow into another song. Yes, I just dated myself by saying I started with cassette tapes. But, I eventually moved onto CD’s and playlists and gave them as gifts or pick me ups to friends and family. Naturally, with my CRPS diagnosis a decade ago, I created mixes to help get me through. Sometimes, I needed upbeat music (normally titled “Happy Playlist,” or “Put a Smile On”). Other times, I needed to be able to feel my anger and sadness and let it all be absorbed by music (“Cry It Out,” or “Let Me Be Angsty”). I also have had countless karaoke machines in which I used to battle friends, create silly duets, and just let it all out. There was an old game that would rate who sang the song better, and I beat my friend Matt with the last note, he’s still mad to this day. So, with a current pain flare happening, triggered by a hip dislocation, I wanted to share some of my playlists with you. I’d love to know what songs you turn to. Headphones have helped me deal with vibration issues, but I’m lucky enough where I can normally listen on speakers to a degree. Some of these songs require a bit of an explanation, so bear with me! I narrowed it down to ten songs for each category. I have enough CRPS playlists to make up blogs for the next 5 or so years. And then I’d have to add songs from the newer years. We’d get a little stuck in our CRPS music circle. “The Lazy Song”- Bruno Mars (Reminds me that it’s okay to take it easy, especially since people take actual lazy days. And there are some really goofy lines in this song). “Tubthumping”- Chumbawumba. So it’s not the most appropriate song when you really listen, but we all get knocked down and the important thing is we get back up and don’t let anything keep us down. “Proud Mary”- Tina Turner. This has always been my good luck song. Maybe it can be yours too. “Rockstar”- Nickelback. Nickelback has such a bad reputation. I love their albums and I’ve been to four or five of their shows. But we all fantasize about being someone else that seemingly doesn’t have any problems, right? “Wouldn’t It Be Nice”- The Beach Boys. Really anything by The Beach Boys works here. Maybe it’s because everything makes me feel like I’m on vacation. “Nerve Damage”- Lifehouse. I came across this song completely by accident. I saw the title and my heart dropped. It gets pretty intense musically for the chorus, which is perfect for angst. But, I relate to this song on really bad days. But to have a song like this out there is really reassuring in terms of not being alone. “Fix You”- Lifehouse. This song can make me cry any day of the week. There’s a deeper personal meaning to this song, especially since it came out right around my initial injury. But, even the title makes me cry. “Faint” Linkin Park. If you need an angry song, this is perfect, I promise you. “Animal I Have Become” -Three Days Grace. Sometimes, I become a bit of a different person when I have bad pain days. And this song is just perfect. It’s a song asking for help from the pain and the anger. Music has really helped me through pain. Also, science has shown that singing out loud releases oxytocin, which can help minimize stress and anxiety while decreasing our feelings of depression and loneliness, which many of us face as a pain side effect. So, whether you can sing the product of Celine Dion, Paul McCartney, and Aretha Franklin or if your singing could break glass, sing out loud anyways! It’s good for you. Download these songs (legally) and get to belting out those choruses!